Paris is not always like its stereotypical images… I don’t want to ruin it for first-time visitors, but after 3 years living in Paris, my ex-pat eyes still catch things that surprise me… Sometimes Paris is just like its stereotypes, it’s even hard to believe how true it is! Yes, we expect there to be a lot, but I’m still surprised at just how many people haven’t gotten the memo that smoking causes cancer. It’s completely socially acceptable to smoke, even from a young age. 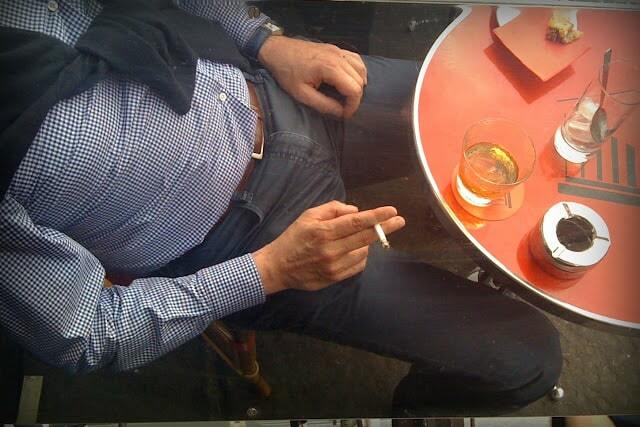 The fact that smoking has been outlawed indoors means that outdoor terraces are a magnet for smokers. Probably the first surprise awaiting tourists in Paris is at the end of their first meal when the waiter doesn’t bring their check when they’re sooooo obviously done. You need to ask for it: catch the waiter’s attention (just raise your hand as s/he walks by or say out loud: “Monsieur or Madame” and then ask: “l’addition s’il vous plaît” or if s/he is far pretend you are writing up in the air: s/he will get the idea. And it’s ok. This took time to get used to, and I think it’s a big part of why French women don’t smile and make eye contact on the street (they get enough attention already). But it’s interesting to me in contrast to the US, where men have been taught to avoid getting caught looking at women; here, if a woman looks nice, a man will naturally admire her. See Camille’s article on the French dating system… or lack of it! Yes, there are many stereotypically frumpy older women, but you will occasionally come across a woman over 60 rocking leather pants or thigh-high boots in an entirely non-trashy way. Or lack thereof. Whereas the “t-shirt bra’s” virtues have been extolled in the American press and even Oprah declared her favorite, French women would say we’re missing the point. Bras here allow for some jiggle, and are by no means meant to be invisible under clothing. Especially after it rains. Be ultra-careful stepping between parked cars as that’s an approved place to let your dog go and not clean up afterward. Male dogs are generally not neutered here, so unlike the US, you will see lots of dangling male dog parts here (and I don’t think they’re implants). When I questioned my husband about this, he said something like “that’s for female dogs”. I’ve done zero research into whether or not this is true, but seriously?!? At first you’ll see a rolled up towel in the gutter and think it’s a one-off, until you see one at almost every corner. Paris has a complex water system (there’s even a museum!) which includes separate clean and ‘gray’ water infrastructures, and when the sanitation system workers flood the gutters with the gray water while cleaning the sidewalks each day, these rolled-up towels serve to direct the flowing water into the gutters. Unlike the US, where street signs are attached to poles on each corner, in Paris blue plaques are affixed to building walls at each corner (if you’re lucky). They also list which arrondissement you’re in, and occasionally a little snippet about the person the street is named after. On many Metro lines, the doors to the train do not open unless you press a button or lift a handle. I call this the ‘take responsibility for yourself’ culture (which includes keeping your eyes open for holes in the sidewalk). Go to the gorgeous park, but don’t go on the grass. There are many beautiful parks in Paris, and probably one of the things keeping them that way is that it is strictly interdit to lounge or picnic on their lawns. Don’t worry, you can always find another nearby park where the lawns are accessible. When you go to an outdoor market, pay close attention to what the customers in front of you are doing. In most cases, you do not select the produce yourself (and you will see signs telling you not to touch). When it’s your turn, the salesperson will choose your produce for you, asking you when you plan to eat it so they can make sure it’s the right ripeness. I still find this system extremely intimidating because of the language and often the long line waiting behind you. One saving grace? The line may be long, but when it’s your turn, you can (and they do) take all the time in the world. I’ve been shocked here at how well children are behaved compared to American kids. At the risk of offending any American parents, I feel like the kids here are more ‘under control’ without being helicopter-parented. For that reason, I see parents often let their kids get very far from them, close to city streets. Maybe it’s the street-smartness that city kids anywhere tend to have. When I first got to Paris, I felt like everyone was walking straight into me on the sidewalk, not giving me the personal space I’m used to. But then I started to realize that, yes, they require less space than I do, but there’s also a smooth movement they make when walking toward you that allows each person to glide around the other. In America, we stand our ground, and our shoulders collide. Here, each person walking toward each other turns their body slightly toward the oncoming person, and voila, enough room for two. If you need to get any shopping done, do it before Sunday and Monday. Food stores will be open on Sunday mornings, but most other stores will be closed, often until late Monday or Tuesday. I recommend tourists in Paris head to the Marais on Sundays, because stores there are open, albeit with the accompanying crowds. 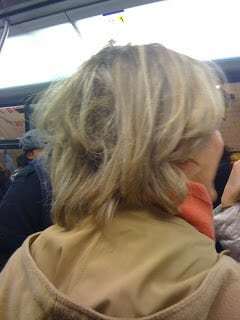 Please let me know what shocked you most when you first came to Paris! On your next visit to Paris, why not enjoy Paris and practice your French at the same time which a French Conversation Tour? Especially selected by French Today, your native French teacher also speaks English fluently, and will share with you the secrets of Paris. Learn French and French culture and customs in context. 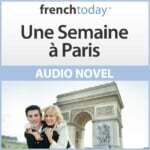 Check out French Today’s downloadable French audiobooks: French Today’s bilingual novels are recorded at different speeds and enunciation, and focus on today’s modern glided pronunciation. You’ll find exclusive mini-lessons, tips, pictures and more daily on French Today’s Facebook, Twitter and Pinterest pages – so join Camille there!